Imagine the bacteria on the hands of 175 school children. The average bacteria count is 2000+ units per pair of hands. In the Rentokil study (2016), the hands of 175 school children were swabbed. One child’s hands measured at 9,999 units. The levels of bacteria that children are exposed to at school is worrying. As illnesses spread, children miss out on lessons and time with friends. Parents struggle to find last-minute babysitters and end up having to take time off work. How High Are Absenteeism Rates In England? The Pupil Absence in Schools in England government report for the last academic year (2016-17) concludes that children are absent for an average of 7.2 days each year during their primary education and 9.3 days each year during their secondary education. This amounts to an absence of 50.4 days during a child’s primary education and 46.5 days during their secondary education, totalling at an absence of 97 days – approximately three and a half months of a child’s entire compulsory education. Contour aims to reduce absenteeism with our range of DeepClean radiators, which are optimised for safe surface temperatures and hygiene. In our last blog post, we discussed how Contour’s DeepClean LST radiators and radiator covers improve hygiene in schools. In this post, we will explain how our DeepClean range reduces absenteeism in schools and maximises the wellbeing of children using BioCote® antimicrobial technology, which reduces bacteria by up to 99.9%. The low surface temperature of our radiators and cleanliness of our covers work together to improve hygiene across schools, with the aim of reducing illness. Research shows that bacteria in primary schools is usually 15x more than ‘normal’ levels. Contour’s DeepClean range is designed to help reduce bacteria and problems associated with bacteria. Rentokil analysed bacteria growth in over 140 primary schools in the south of England using an ATP bioluminescence reader. A reading of over 500 units indicates a high level of contamination; a reading of 200-500 units is deemed normal, and under 200 units is low. Traditional radiators recorded an average of 858 units, almost double the ‘normal’ range of bacteria. Radiators heat to the ideal temperature for the growth of harmful microbes, often causing dangerous levels of bacteria that can spread around classrooms, infecting multiple children and causing attendance rates to drop significantly. The convection process encourages the spread of airborne bacteria; children are breathing in high levels of microbes, as well as carrying them on their skin after touching infected surfaces. Luke Rutterford, Technical Manager at Rentokil Specialist Hygiene. The Pupil Absence in Schools in England government report (2016-17) shows that one in ten pupils are persistently absent in the UK. The absence rate for primary schools was 4%. The absence rate for secondary schools was 5.4%. The persistent absence rate for primary schools was 8.3%. The persistent absence rate for primary schools was 13.5%. By reforming classrooms for better hygiene and higher attendance rates, school children can reach their academic potential and avoid the gaps in education that come with frequent absenteeism. Contour works with BioCote® to inhibit the growth of bacteria that leads to classroom-associated illnesses and improve school attendance; BioCote® antimicrobial additives are incorporated into the paintwork for all DeepClean LST and anti-ligature radiators (and radiator covers). BioCote® suppliers specialise in the development and application of anti-microbial technology. The additives contain silver ions that damage the cell walls in bacteria, preventing microbes from reproducing. The additives are fast-acting and long-lasting; BioCote®-treated surfaces show significant microbial reductions in just fifteen minutes of exposure to bacteria and up to a 99.5% reduction in under two hours. BioCote® is the only anti-microbial technology to demonstrate over a 95% decrease in bacteria. All additives supplied by BioCote® are regularly and rigorously audited in a quality control procedure. BioCote® was tested for educational environments in a study where a BioCote® treated classroom was compared to a non-treated classroom (2014). The treated space proved to eliminate almost 96% of bacteria commonly found in classrooms. Absenteeism was 20% higher in the untreated classroom. BioCote’s certifications to prove the independently verified efficacy of their anti-microbial coatings are available here. 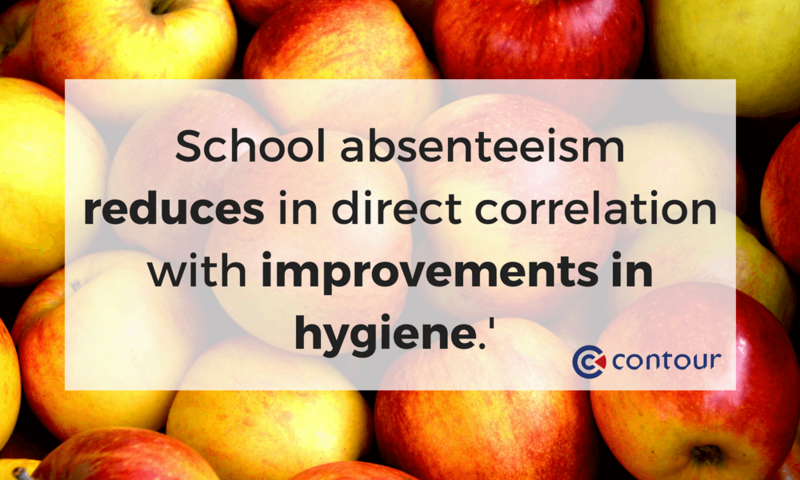 How Can Contour Reduce Absenteeism In Your Educational Environment? Contour aim to maximise the health and happiness of school children and students across all educational environments. We can reform the radiators in your classrooms and other educational spaces to make them as hygienic as possible with our DeepClean range of heating solutions. To speak with one of our heating experts about the best options for your educational facilities, sign up below. Learn more about LST radiator solutions for schools here.